We are going to explain exactly what a fossil is, and how one is formed, by telling the story of a prehistoric creature and how it came to be found in a cliff fall at Fossil Beach. Our creature is an aquatic animal, but land animals and plants where also fossilised in a similar way. This is our creature, swimming in warm shallow seas, in a time when the world looked very different to how it does today. 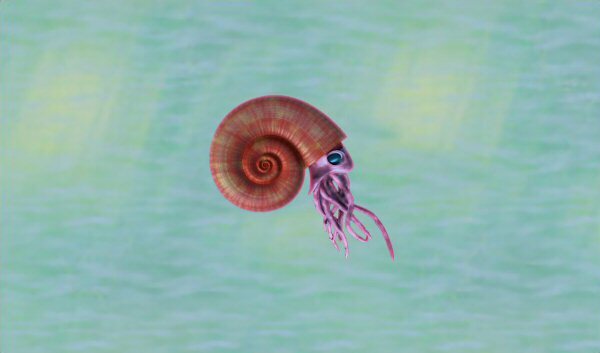 The creature is an ammonite, and was extremely abundant during the Jurassic period (from 206 to 144 million years ago). The ammonite consisted of a coiled shell, with a fleshy 'squid-like' body protruding from the opening. The animal could partly retreat into the shell if it was attacked by a predator. 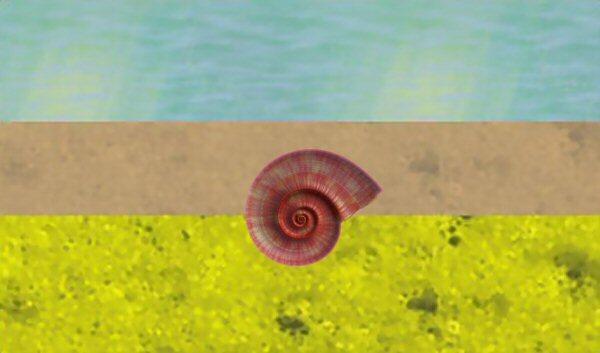 (We do not know exactly what the soft, fleshy part of the animal looked like, but we can make some good guesses based on how similar living creatures look today, such as the nautilus). 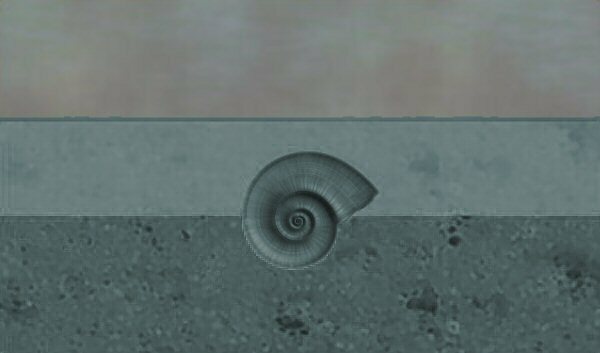 For some reason, our ammonite died. Perhaps it was killed by a predator, died of a disease or just through old age. 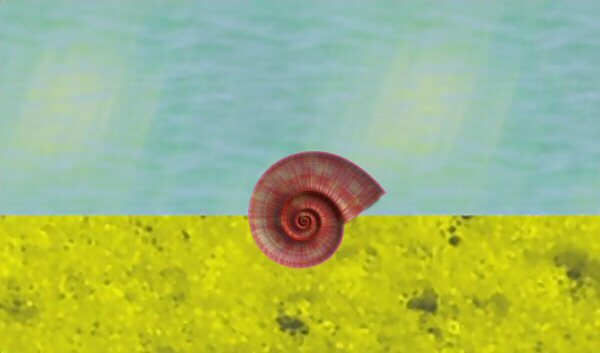 When the creature died, the shell ended up on the sea bed, and the soft, fleshy, squid-like parts of the animal quickly decomposed or were eaten by other creatures. The shell became covered in silt or sand, which protected it from stormy seas and damage. After only a few hundred years the shell could be buried quite deeply. These conditions improve the chance of the shell becoming fossilised, but many factors have to be right for the process to produce a perfectly fossilised impression. Over thousands of years the shell become covered by deeper and deeper layers of sand and silt. As millions of years passed, the climate changed and the ocean receded. The area that was once a sea was now on dry land. The shell of the ammonite decomposed. Voids left by the shell were slowly replaced by water that was rich in minerals. The original materials of the shell were thus replaced with a rock-like substitute of the original creature. This process is called 'permineralization'. Over this time, the compressed seabed also turned to shale or rock. Millions of years of erosion by wind and rain saw successive layers of the fossilised sea bed removed. 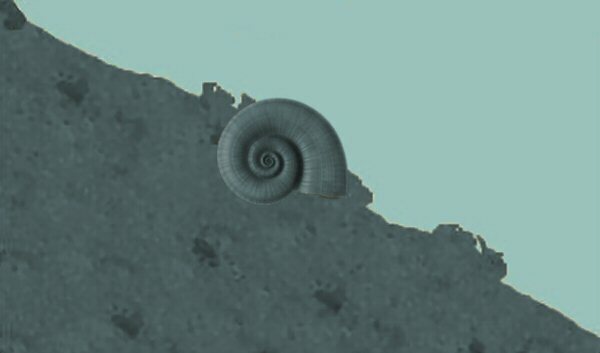 Further climate changes and movement of the earths crust, cause changes in the sea level, and today our fossil ammonite is in cliffs on the coast. The rock that was once seabed is exposed to the elements, and particularly the actions of the sea as the waves pound on the cliffs. Movements in the earth's crust mean that the original seabed layers are no longer horizontal. After more than 140 million years, the ammonite is exposed, and ready to be discovered by a fossil collector (paleontologist). Do you want to look for fossils yourself? If you want to find out more about fossil collecting, go to the 'About Fossil Beach' page and learn what you need to do. 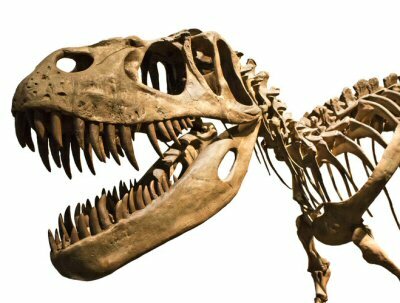 This page also contains links to other fossil collecting, geology and paleontology web sites.